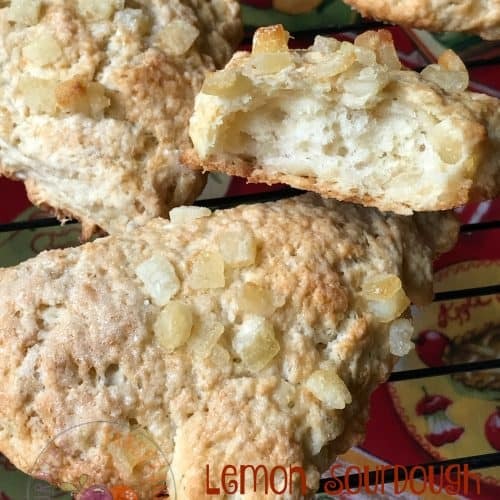 Lemon Sourdough Scones are light and lemony with a hint of tang from the sourdough starter. 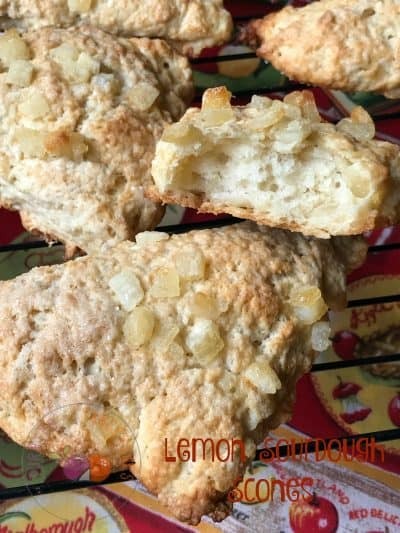 Candied chopped lemon peel is added to the scone batter and then the tops are brushed with a small amount of milk or cream, sprinkled with sugar and extra candied chopped lemon peel provided by Paradise Fruit Co. before baking. The result is a tender scone with just the right amount of sweetness, perfect with your morning cup of coffee. I have been mentioning Paradise, Inc. for sometime now and I thought it was time for you to learn more about this fantastic company. Paradise, Inc. is a candied fruit company that has been business for a very long time. They are the leading producers of candied fruit in the world. Shop for fruit online through the Paradise Fruit Co. Amazon online store. Paradise Brands Brings You a Rich Tradition of Delectable Confections…. For nearly three-quarters of a century, Paradise, Inc., has produced, packed and distributed its brands of Candied Fruit, which have been the favorites of homemakers and commercial bakers throughout North America. Paradise Candied Fruit can be used in a variety of recipes from cookies, candy, fruitcake and marinades. The company, Paradise; began as a subsidiary of a diversified corporation soon after WW II, but shortly thereafter, Candied Fruit became the focus of its business and other operations were either sold or closed. In 1961, current ownership purchased the company, and the name Paradise Fruit Company was adopted and later incorporated in 1965 as Paradise Fruit Company, Inc. The company’s name was changed in 1993, to Paradise, Inc. The Paradise Brands include PARADISE™, PENNANT™, SUNRIPE™, MOR-FRUIT™, DIXIE BRAND™, and WHITE SWAN™. In addition, some of America’s leading grocery retailers like; The Kroger Companies, Safeway Stores, Inc., Food Lion, LLC and Bi-Lo, LLC have such confidence in Paradise quality, that they offer it for sale, under their own labels. Today, these brands make Paradise, Inc. the largest manufacturer and supplier of consumer packaged Candied Fruit in the world. No Sourdough Starter?? No problem! You can still make this recipe by increasing the flour to 1/2 cup and use 1/4 cup buttermilk to compensate for the sourdough starter. Into a mixing bowl, sift together flour, sugar, salt, baking soda and baking powder. Cut in the butter with a pastry blender or two knives until the mixture resembles coarse meal. Stir in candied lemon peel. Gently pat dough into a circle about 8" in diameter. Using a floured knife, cut into 8 wedges. Brush tops with milk, sprinkle with sugar. 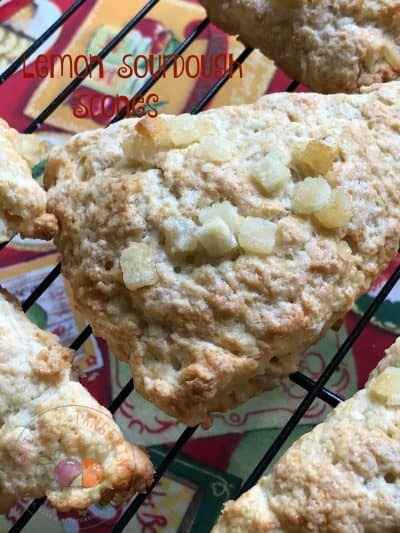 Sprinkle tops of scones with candied lemon peel. Carefully transfer wedges (use a spatula or pie server) to a lightly greased baking sheet, placing them at least 2" apart. Bake at 400 degrees for 15 to 20 minutes, or until golden. Transfer to a rack to cool slightly before serving.